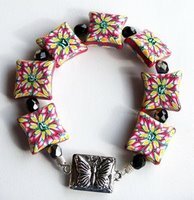 One of the reasons I began working with polymer clay is because I wanted different beads for the jewelry I was making. I live in a very small town with not alot to choose from for craft supplies and I wasn’t on line at that time. I started goofing around with the polymer clay and fell in love with it. The things that can be done with it are endless. I try to challenge my self by working outside my color comfort zone. I work very little with red and yellow so I was very surprised about how much I like the beads in the photo. I made 2 sets of each bead shape I put one set of each in my Etsy shop for others to use and then I made the bracelet and necklace in the photos above. Today’s blog post is re-published from Ginger’s blog.Â Her etsy shop is GingerBellsGifts.